Tourists flock to Kelowna for many reasons. Whether it is the scenery, activities, or wineries there is no keeping visitors away! While tourists are able to flock to their destination before heading home, property owners have to contend with the less desirable parts of Kelowna – namely rain! Everyone knows that the Okanagan region is a wet one and that makes our Kelowna gutter cleaning services are an essential part of your routine property maintenance. Long dry summers in Kelowna are nice, but owners are still facing harsh weather throughout the year. Annually, the city itself sees around 15 inches of rainfall. With high humidity and precipitation, impassable drainage systems can mean structural damage, rot and even pests. Whether you are an owner or manager, no one wants to be left dealing with water damage – especially when it is avoidable! Without regular maintenance, you can expect layers upon layers of debris, keeping water from moving freely. In a covered space, water creates an ideal environment for unwanted organics and pests to thrive. As water backs up and rests against construction materials, it can soften them, wearing them away. This softening makes way for entry points for not only water, but pests as well. Save yourself the trouble of water damage or uninvited guests with a little help from our maintenance professionals. If you haven’t had the privilege of coming face to face with a cluttered eavestrough, you can expect one big mess. Not everyone is keen to stick their hand into the muck that has collected within your system throughout the year. Our professional gutter cleaning uses a multi-step process for the best results. Our Gorillas give you the best possible results by breaking your perimeter drain cleaning into stages. Preparation is the first and most important step in our Gorilla’s methods. All equipment is set up, checked and secured for safety before any work begins. Each member of the Gorilla team is fully insured, so our safety – and your property – are always in good paws. ‘Before’ photos keep our clients in the loop from the safety of the ground. ‘After’ photos help our Gorillas show off our great results that leave you fully satisfied. Now, the real work begins! Our Gorillas get to work clearing the roof of leaves, branches and other debris. Removing the debris extends the life of your drainage system by removing possible blockages before they happen! 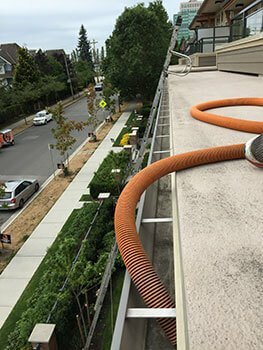 Next up is our gutter vacuuming, the only way to guarantee your system is completely clean. Sure, you can get rid of larger matter by hand but our method removes sand, grit and every last pine needle. Thorough tests are mandatory before a job is complete. Our Gorillas run a hose with a low pressure water flow from the gutter. This allows the interopr and exterior of the guttering and downspouts to be inspected for leaks and blockages, and replaced if necessary.